Ti's the season for hail, in fact we've already had our fair share. Last week alone, our body shop (Coppell Collision Repair) was busy repairing victims of two storms, including those with just a few spots to several that were completely peppered including shattered glass. 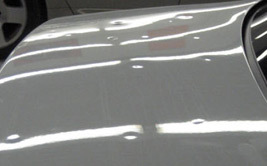 Paintless Dent Repair (PDR) is the technique most often used to repair hail damage. PDR is less expensive than traditional collision repair and can be used when the paint is not scratched, the metal is not creased, and the dent is the size of a credit card or smaller. We offer Paintless Dent Repair and glass replacement at both our maintenance and repair facility and the body shop. While we always offer free estimates without appointments, hail damage typically requires an expert eye, so we encourage you to schedule an estimate appointment with our PDR specialist. If you plan on going through insurance which is usually the case with hail damage, it is best to have their adjuster do the first estimate. Feel free to drop the car with us to coordinate with the adjuster. Call Coppell Tire & Auto at 972-393-2521 or Coppell Collision Repair at 972-247-8114.
is growing very fast bcoz of its benefits and services or the service providers (auto body repair shops). My car also got some dents on its side window. I just want to remove those dents. So I am finding auto body shop that can provide good dent repair service. Our goal is to provide the support, resources, and networking abilities that industry professionals need and rely on. We go beyond customer support and assistance and connect the industry to immediate responses and a wealth of knowledge backed by approved, qualified claim-related business and experts.